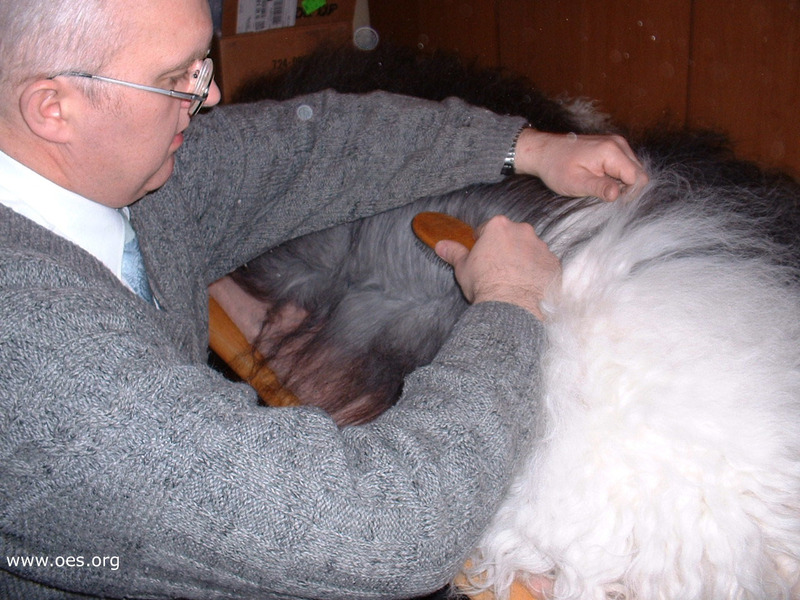 Establishing the first "line" is always the most difficult because of the coat's pre-grooming condition and hair being crossed when the dog is laid down. 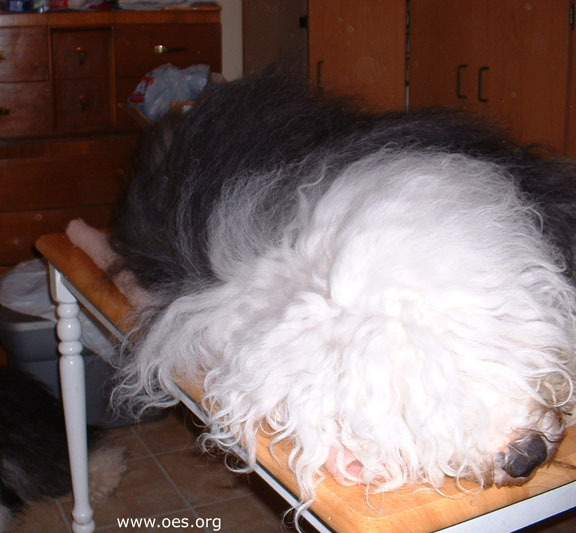 To reduce the hair crossing as much as possible, be sure to lay your dog down according to the instructions at the beginning of this tutorial. 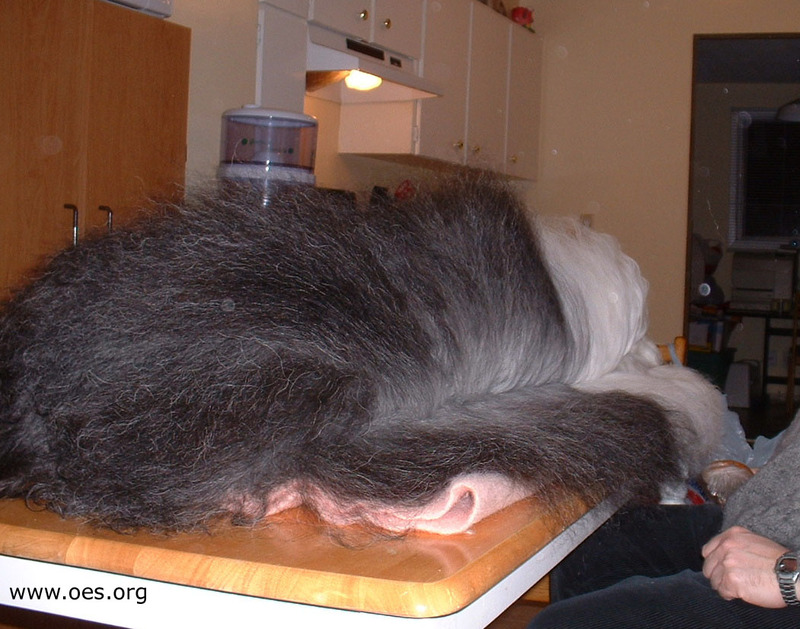 As you look at her, her back, neck and skull define a roughly straight line which will become a basic reference for you. 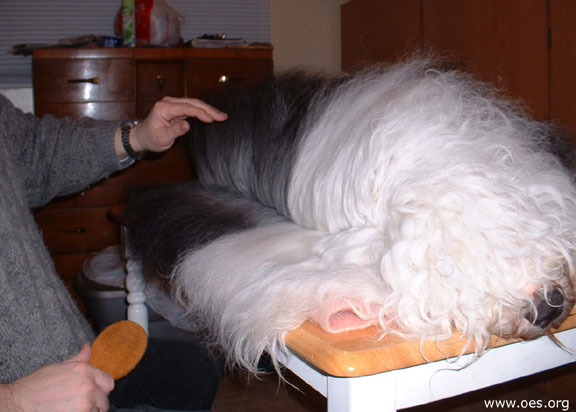 The first thing you will want to do is briefly and superficially brush the coat in its natural line of growth and fall, that is so that it lies down much the way it falls while the dog is standing. 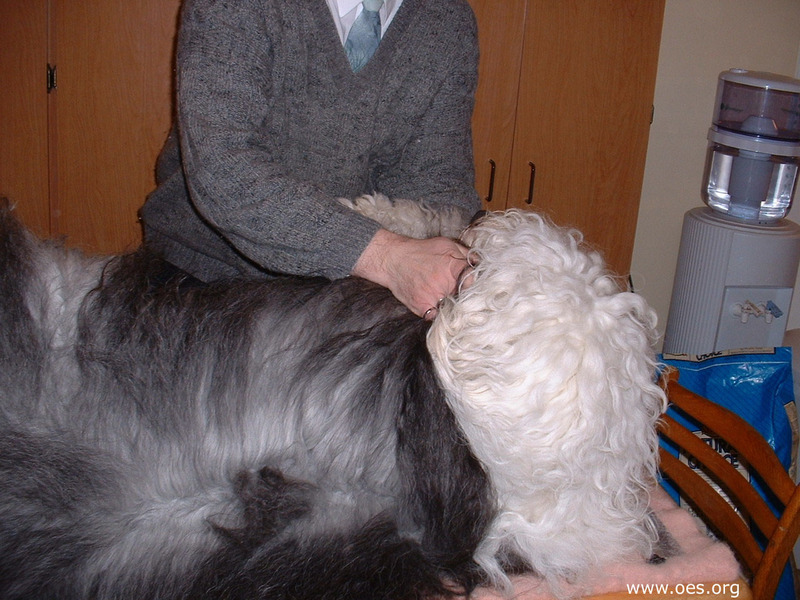 This then shows the spine much better and you can start the line grooming. 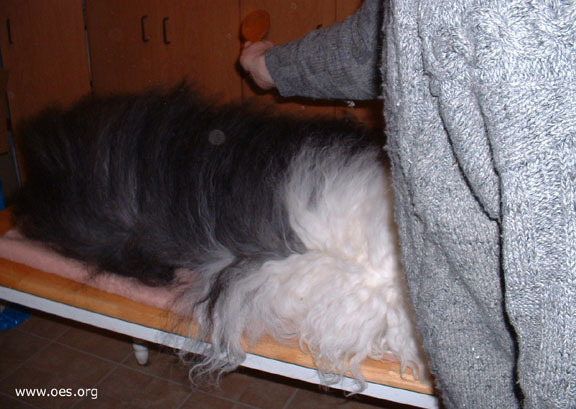 Envision a line parallel to your dog's spine about 1-1.5 inches down her body. 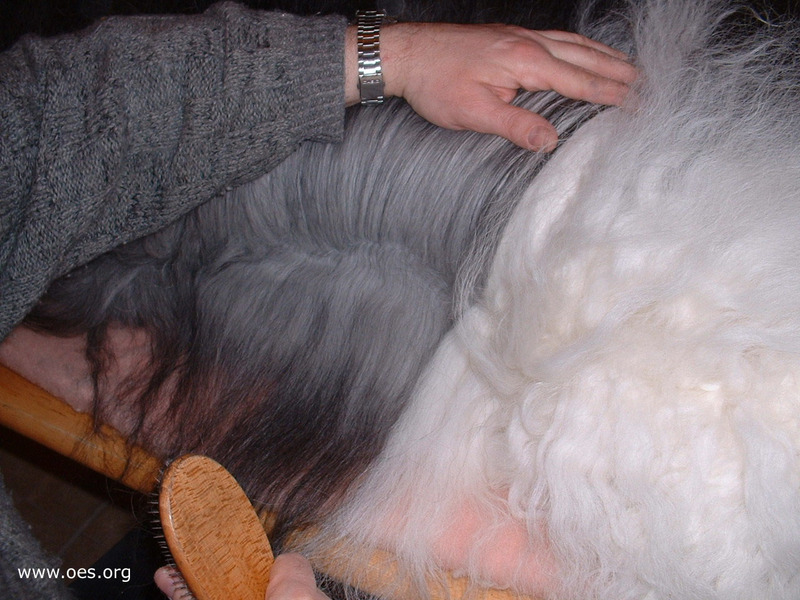 Brush the hair back, opposite to the natural direction of growth, all the way down to the skin. Take your time and be gentle so that you don't break the guard coat or tear out undercoat that isn't loose and ready to come out of its own volition. While brushing the first few lines it is often necessary to hold the un-brushed hair in its place with the "free" hand to maintain access to the line being brushed. The first line about half established. When completed, the line should be a definite sharp parting, hair above (closest to the spine) laying smooth towards the table edge (against the grain so to speak), hair below it, closer to her sternum and belly ungroomed but laying "with the grain". 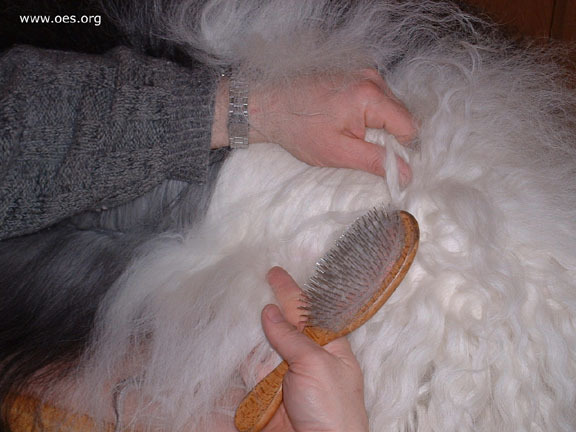 Anytime you encounter a knot or "tight" areas of coat groom these out, possibly using a grooming comb, slicker or matt rake as necessary. 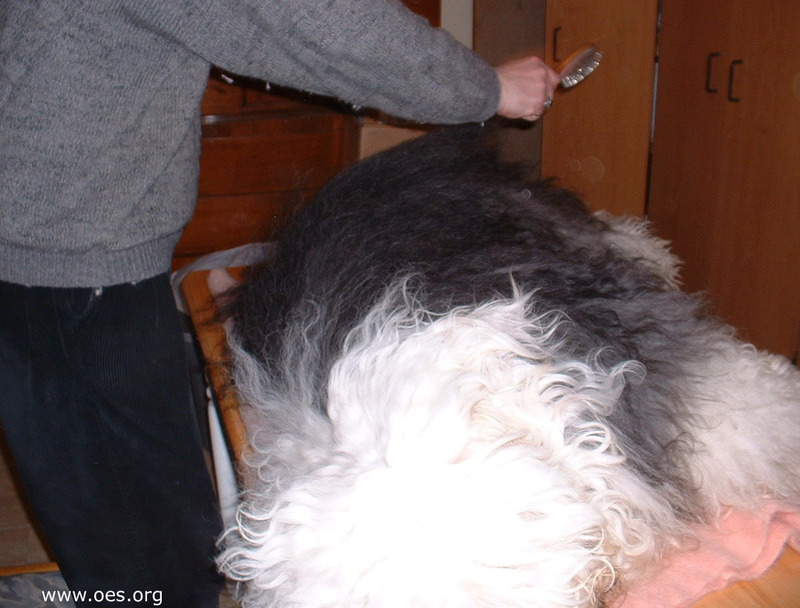 Be very cautious with any of these dematting tools as it will be all too easy to strip out otherwise healthy undercoat if you are too vigourous or energetic. The first line is completed. Next!